DISTRIBUTION Each month Profile Magazine is read by over 37,500 readers monthly across Sunshine Coast and beyond. Grab your free copy on the Sunshine Coast or online at profilemag.com.au. D I G I TA L Our email magazine is sent to 14,000 inboxes monthly. We have an average social media reach of up to 150,000 per month across Facebook and Instagram. Profile is available to read and share on issuu.com, attracting up to 60,000 impressions per month. Our overall digital reach is up to 315,000 per month. 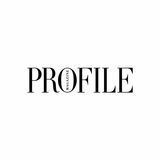 Profile Magazine is a free publication (subscriptions available) published monthly by CPM Trust. All rights are reserved and the contents are copyright and may not be reproduced without the written consent of The Publisher, CPM Trust (â&#x20AC;&#x153;The Publisherâ&#x20AC;?). Their related companies and officers hereby disclaim, to the full extent permitted by law, all liability, damages, costs and expenses whatsoever arising from or in connection with copy information or other material in this magazine, any negligence of The Publisher, or any persons actions in reliance thereon. Any dispute or complaint regarding placed advertisements must be made within seven days of publication. Inclusion of any copy must not be taken as any endorsement by The Publisher. Views expressed by contributors are personal views and they are not necessarily endorsed by The Publisher. Profile Magazine Founder and CEO of global coaching company, Iconic Empires, Genine Howard reveals one simple daily practice to help us adapt quickly in our ever-changing business world. We are in a state of massive, unprecedented change in the world. We humans are searching for more in life – more meaning, more freedom, more choice, more time. And this yearning is boiling over into the corporate world. In my experience as a business coach for entrepreneurs over the past few years, I have seen firsthand the almost literal ‘jumping out the corporate window’ all over the globe. I have coached women who were in finance wanting to become yoga and meditation teachers, social workers wanting to create parent coaching programs, lawyers yearning to do more good in the world by teaching spirituality and abundance. AND THESE WOMEN ARE NOT ALONE All around us we are seeing a massive shift in the way people want to live – the Sunshine Coast, in particular, is more popular than ever before for corporatefatigued Sydneysiders and Melbournians looking to raise their children here with more freedom and security. Even my family and I moved back from a few years in the city, to raise and school our children here on the Coast. This trend is only the tip of the iceberg and, if you own a business, you had best get set to adapt quickly to keep up with the ever-changing desires of your employees. So just how can you keep up in this fastchanging world, or better yet, how can you lead the way in doing business that creates more freedom, money, time, choice and flexibility, for both you and your employees? what I term ‘waking up’. They are waking up that there really is a different way of being and doing in both business and life. They are waking up that what they used to define as success has changed. But to what? I see many people stumble because, at their core, they know they want something different, they want more meaning; however, what that actually is, they can’t put their finger on it. “WHEN I BEGIN COACHING A CLIENT, I START BY ASKING ‘WHAT DO YOU WANT?’, AND, MORE OFTEN THAN NOT, THIS IS THE KEY CHALLENGE BLOCKING THEIR GROWTH.” So this is the crucial place to start if you want to be a leader in business today and to lead a more connected, on-purpose life. Well then, just how do you work out what you value? How do you tap into what your purpose is so that you can have more time, more freedom, more choice and more flexibility. Here is where I like my clients to start JOURNALING Yes, yes, I hear some of you groan when I say journaling. You know it’s something you probably should do, but often there is resistance to, what I believe, is a fundamental daily activity to tap into your values and desires. So first, let me get this straight. Journaling is not keeping a diary. In fact, journaling is less about what you did each day and more about tuning in to a space of ultimate potentiality. I see the process of journaling as a sacred act of allowing yourself to move into your creative mode, into full imagination of what could be possible and, sometimes, awareness of what is blocking you from achieving that. where it all starts. It’s where I become clear on who I am, what I am here for, what I desire to experience, the business I want to develop, the way I want to be in this world. And for the naysayers, all I suggest is that if you are not sure on where you want to be going with your business and life, or perhaps your business is not growing or feeling heavy, then why not try something different? What I have learnt over the years is that business is more about who you are being than what action you are taking. I mean, we’ve all been in the ‘busy being busy’ mode before, and I ask, how did that work out for you? Business and life, in this ever-changing world, is about being tuned in, being adaptable and nimble-to-change as our society’s values change. And that includes our employees and our customers. So, if you are wanting to be a leader in business, to live a more connected, on-purpose life, then perhaps it’s time to get out the pen and paper and get journaling. As they say, all things start from a thought. Use the opportunity to think better thoughts in the process of journaling and tune into your own internal wisdom of where to set the course of your business and life. Many people say they don’t have time to journal, however even though I am a busy mum of two I still set aside time just for me each morning to connect, align and create space to do my daily practice. Carly Willoughby Rolls is a qualified life coach, educator and changemaker who helps modern women ditch their busy, overwhelming lifestyles to find contentment. Profile sits down with Carly to find out how ‘mum life’ drove her to become a minimalist. Earning great money, spending it on designer clothes, and living in a nice suburb in a fancy apartment in Brisbane – from the outside, Carly Willoughby Rolls had it all, yet she still felt a bit lacklustre. Having grown up living in an uncomplicated household in regional Queensland, Carly tells me she had a simple childhood, but, as an adult, ‘simple’ very quickly became ‘busy’. As life took over, she says she was trying to maintain a certain perfection, but instead found herself feeling anxious and stressed. THREE SIMPLE STEPS TO DECLUT TER. ASK; • Do I need this anymore? • Does it bring me joy? • Is there a sentimental value anymore? While it’s sometimes easier said than done, how do we maintain a minimal lifestyle without slipping back into old habits? “The questions I ask if I’m buying something new: Is it the best quality? Is it going to last for a long time? Do we really need it? Do we already have something like this?” says Carly. “I guess shooing convenience for practicality,” she adds with a laugh. While buying, owning and having less started out as a short-term lifestyle, Carly says now it’s one she doesn’t think will ever change. Listening to her, it’s clear that what’s most important about being a minimalist is that you make it suit you and your life. “I’m still in the trenches trying to figure this out as well,” she says. “It’s absolutely alright to not have your life together; anyone who gives the perception that their life is completely together is probably the person who needs to do the most inner work.” Carly is enthusiastically throwing herself into a series of exciting new projects this year, so watch this minimalista’s space. Born out of a love of the humble kimono, The Travelling Kimono has flourished into one of the most sought after labels on the Sunshine Coast. It is steadily gaining a devoted following across Australia, thanks to their quality garments and dedication to sustainable and ethical practices. The Travelling Kimono boutique in the heart of Noosa Junction is a beautiful and welcoming space, brimming with stunning garments, unique trinkets and handmade accessories. You can tell that owners Janelle Rawlins and Nicki Edmiston have put a lot of love into creating the boutique; almost as much love as what goes into hand-making each item of clothing. Every Travelling Kimono piece is lovingly created with exquisite details like handbeading and lace trimmings, and comes in quality fabrics like luxurious silk, delicate cotton and breathable linen. Most of us only see this side of a fashion label; the final product and the store it’s displayed in. But there’s hundreds of other steps that go into creating an item of clothing, and Janelle and Nicki are ensuring they approach each of these steps as transparently and sustainably as they possibly can. Janelle started the label six years ago with her friend Tara after falling in love with sketching and designing kimonos. “I was a personal trainer for about 10 years. I was far from being into fashion. It was more that I wanted to do something creative and something from scratch; something that I started,” she explains. “I was obsessed with kimonos at the time and I hated the price of them when I knew they were just mass produced and poor quality. I had family friends in Vietnam so I knew we could hand make them and they’d be amazing quality. I did a trip over and got some made for myself and the quality was insane.” Janelle is a mum of three and says getting the label to where it is today has been a slow and gradual process. But since having her youngest baby and bringing on lifelong friend Nicki to The Travelling Kimono team, her focus has changed and she has big plans for the future of the label. “I think we can take it to another level now,” she smiles. One thing Janelle was always certain on from the beginning was producing the garments with the environment in mind. All The Travelling Kimono pieces are hand made by a woman called Men who Janelle says has become more like family over the years. The production process involves designing the pieces, sourcing deadstock fabrics from a market in Ho Chi Minh city, then working out what fabrics will suit each piece. If you’re unfamiliar with deadstock fabric, it’s leftover textiles (sometimes thousands of metres) that labels no longer want because it didn’t turn out the way they had hoped or they produced too much. “We use the ends of rolls or leftover fabrics so that we’re not contributing to the wasteful textile industry. There are so many good fabrics out there so our aim is to try and use them,” says Janelle. team nearly two years ago. She’d been volunteering around the world in organisations that focused on human trafficking prior and when she returned to Australia she was unsure of what to do. With some convincing from her best friend Janelle, she moved to the Sunshine Coast to start afresh. “I always used to say to Nicki, ‘I don’t know how but you’re going to be involved in The Travelling Kimono one day’,’’ says Janelle. The pair acknowledge that being an eco friendly label comes with its complications and contradictions, but they also know being perfect is impossible. “Sustainability is a huge journey in itself, so for us, if we do limited runs, use only what’s available, make it as natural and organic as possible, and continue to hand make, then we’re happy,” says Nicki. A big goal the pair have for the future of The Travelling Kimono is to support the community they work with in Vietnam. With high levels of domestic violence in the area, they hope to help teach the women how to sew, speak English and simply have a safe space and support system that they can rely on. While the process towards a fully sustainable and ethical label is an arduous and complicated one, Janelle and Nicki are making monumental change in a traditionally wasteful industry, while changing the lives of many women in Vietnam. outfits in store is that you can take it from the beach and then put on a pair of heels and suddenly you are set for an evening out,” explains Teneale, pulling out different styles to take you from day to evening. The boutique offers a range of brands including Adrift, Lula Soul, Natasha Gan, Naudic, Robb & Lulu, Ruby YaYa and Solito, allowing women to find something for any occasion. find their perfect fit and style. “The fun and the flamboyance of this store, the excitement and the colour that we bring to the Coast, I think is really important because it’s the first time we have actually opened something that does throw that colour out there.” The store opened its doors late last year and has just recently launched its online store thanks to high demand from interstate visitors and overseas tourists who fell in love with the products on offer at Birds in Paradise. The next time you are in Mooloolaba, grab yourself a coffee and enjoy the exotic elegance Birds In Paradise has to offer. A woman with passion is how I would describe Carren Smith. As life goes, it takes you on a journey, but Carrenâ&#x20AC;&#x2122;s life has been more of a roller coaster ride. She shares how she founded Spirit Hive after losing her partner to suicide and fighting for her own life after surviving the 2002 Bali bombings. time to do advertising and social media,” says Craig. The pair fell in love with the 1930s style car dealership, the old Madill garage, which has been gorgeously renovated, boasting an ornate granite bar in the restaurant, exposed brick walls and beams and a stylish patisserie, welcoming locals and destination diners seven days a week. espresso coffee is amazing and everything is made onsite, including the bread. The pizza and lamb dish with ratatouille is good, honest food.” “We now have the company at a place where we have good managers in place and we can have time with our kids as a family.” Already, two weddings are booked for the end of the year at this trendy new restaurant, with plans to turn the terrace into a beer garden with vine arbor, so book a table today. Limited Release Terrace Homes From $318,000 Minimum maintenance and maximum lifestyle is what the Terrace Collection is all about. Enjoy the comforts of a full sized home on a terrace allotment with width sizes starting from 4m and going up to 8m wide. With internal courtyards perfect for entertaining, front or rear entry double garage options, large gourmet kitchens and open plan living, there is a multitude of designs constantly evolving to suit all sizes of allotments. High ceilings and internal voids in the well-designed layouts ensure excellent light exposure to these modern and contemporary home designs. Youâ&#x20AC;&#x2122;ll miss out on nothing when you buy a Terrace Collection home, except mowing the lawns! With no body corporate to worry about, the Terrace Collection is the perfect solution for a busy family, professionals or retirees. Easy to live in and easy to lock up and leave. Splitting her time between Noosa and Bondi, Melissa Ambrosini opens up to Profile about moving into her dream home in Noosa, after renovating the ‘Tree House’ to be toxic-free and organic. Here we reveal Melissa’s journey to creating her very own wellness sanctuary. her dream home, she wanted it to reflect her inner journey. So she sought expert builders to renovate the house to be toxin free and organic. “Our aim is to live as toxic free and as organic as possible, so when it came to designing our home, that was a major priority for us. We used toxic free paint and glues and the most natural materials we could find,” explains Melissa. and was even on the tools at times. Melissa explains that the process, like many renovations, had its ups and downs, as Nick thought on his feet, and moved through any challenges with ease, as they both watched their dream come together. The pair worked with architect and long time friend of Nick’s, Dirk Anderson, from NDRSN. “He actually came and stayed in the house with us before we started the renovation, to really get a feel for what we can create,” says Melissa. Dirk adds, “The home is surrounded by these panoramic views of nature and the interiors have been reworked with softer natural materials of stone, timber and textural furnishings to reflect the surrounds.” He says the clean lines of weatherboard walls really mirror the character of the coastal location, along with the selection of striking charcoal finished joinery, making it a contemporary feel. “It’s the contrast of tone, which tends to lead the eye towards the external outlook, accentuating an experience of being completely surrounded within the canopy of a tropical forest,” says Dirk. The ‘Tree House’ is a stunning example of how you could be left speechless when seeing it for the first time, and that’s the exact reaction Melissa received from her family. “They loved it. How could you not? Nick’s parents saw a lot of it during the process but they were still blown away, and my parents were speechless.” In regards to the interior furnishings, it was important for Melissa to stay local, so she enlisted Clo Studios to help with the interior design process, in which the ladies sourced everything from the neutral couch, to the artwork and the rugs. moment for me as the one thing I needed in order to work was my body and that was now taken away from me. It was the first time I realised that, if you don’t have your health, you’ve got nothing.” This was the turning point for Melissa to get her life and priorities on track. She went on to study nutrition at the Institute of Integrative Nutrition, coming out with a holistic health coaching certificate, before going on to study yoga, life coaching, energy healing and meditation. She read every self help and personal development book she could get her hands on to help her on the next chapter of her life. Along the way, she started sharing her journey and knowledge with others. Sharing that it’s okay to put yourself first. It’s well known that beauty comes at a price, but, at the moment, it seems it’s also coming at a cost to our environment. Hair salons are sending more than 1.5 million kilograms of aluminium and colour tubes into landfill every year, a nasty statistic that was enough for hairdresser Haras Tarlinton to cut out waste and make a difference. in their rubbish. To their relief, they did. “We realised that salon waste had no place to go – except into landfill, or into a yellow council bin. Small businesses can’t actually put most of their waste in that bin, like hair or chemical waste, most plastic or fillers from product delivery,” explains Paul. in CONSTRUCTION You only need to look around the Sunshine Coast at the moment to see how dynamic this place is in terms of growth, both residential and commercial. Our best kept secret is fast becoming a wellknown destination for holiday makers and relocations, which means change… good change. For us at Vantage Building Group, one of the most exciting things about this change, is that more women are choosing to enter and work in the construction industry. “Vantage employs the right people for the right job,” says Director of Vantage Shane O’Brien. “While we pride ourselves on this fact, we’re also exceptionally thrilled with the number of females employed to help us reach the calibre of work we do. In fact, 30 per cent of our current workforce is made up of women.” From 2005 through to 2018, together with the accommodation and professional services sectors, construction remained one of the more stable industries amongst its highest competitors throughout the nation. Here on the Sunshine Coast, construction is the second largest employment sector behind health care and social needs. With statistics such as this, it’s no wonder more and more women are attracted to the industry. at Vantage will stop you,” laughs Kate. Antonia O’Brien has been with Vantage for over two years now, is a graduate of Curtin University with a Masters in Architecture, and is part of our Drafting team. For Antonia, the biggest attraction continues to be the achievements associated with starting with a bare, blank canvas and working to create a beautiful home, that in many instances, has a lasting impact. “I enjoy site visits and watching the build come to life. The reality of the building site can be quite different, you learn so much from the site foreman and trades, that it really translates back into your future creations,” says Antonia. The positives of a stable, ever advancing industry just keeps growing. As the Sunshine Coast continues to move forward, you can be sure Vantage will be at the forefront of this growth, and as we continue on this journey, watch this space as we’ll be constructing our leaders of the future too. Just a girl boss building her empire. I C O NI C E M P I RE S . C O M WE BUILD EMPIRES. Compliance is a word that should be embraced not feared. It allows your business to remain sustainable and ahead of the competition by focusing on continued improvement. WHS: The acronym has been known as OHS, OH&S and HSE but they all focus on workplace health and safety. It’s legislated that employers are to make the workplace as safe as practicable. It also states the workers are also responsible for creating a safe workplace. By streamlining processes, risk management and human resources, you are a workplace that will be forward in WHS and reduce costs incurred from workplace injuries, fines from government agencies and be socially responsible. Quality: What is it? And how do you measure it in your product or service? Quality is a process intended to ensure that product quality or performed services adhere to a defined set of outcomes or standards. This equates to consistency of product/service quality and any defects/issues that can be picked up beforehand. Think of McDonalds – you know exactly what you are going to get when you order that cheeseburger. There is no deviation from the quality process. What three steps can I take to adhere to quality and WHS standards? 1. A strong management system. 2. Policies and procedures that are aligned with the system. 3. Training for employees to guarantee compliance. Chances are you have heard the debates going on very recently about mortgage brokers and the way they get paid. Most mortgage brokers are free as they get paid an upfront payment, by the Lender, once a loan is settled and then a monthly trail fee. The Royal Commission is recommending that the upfront payments and trail be abolished so that the customers pay a fee for service to the mortgage broker. With over 17,000 mortgage brokers in Australia, industry representatives are lobbying across the country to ensure that these recommendations do not pass legislation. It is feared that this move may reduce competition giving the big banks greater market share, thus leading to increased interest rates. For borrowers, it may mean paying a service fee to a mortgage broker which will be a percentage of the loan amount, or a fixed price. Borrowers may opt to go directly to a bank for free, however in today’s’ lending environment, it may not be as easy. Borrowers could end up having to approach many banks to get the outcome they need. Going to a mortgage broker gives the borrower choice straight up and can often save them thousands of dollars in the process. For more information on the Royal Commission changes, contact leading mortgage broker Deborah from Aussie Dream Home Loans. Communication: 3 Steps to Ultimate Impact and Influence “I hope to inspire and motivate others to BELIEVE anything is truly possible. If you’re never given limits, then you think ‘I can do anything’,” – Jennifer Bricker. Born without legs and abandoned at birth, Jennifer Bricker was adopted by a loving family who raised her with no limitations and one simple rule – never say the word can’t. Her inner-drive and commitment to bring positive inspiration for change resulted in her becoming an accomplished acrobat and successful speaker worldwide. Whether you are a budding entrepreneur or the CEO of a large organisation, effective leaders know how to step into their ‘no limitations’ so that they can inspire, empower and support others. In order to engage and influence confidently and authentically, communication skills are fundamental to creating your success. 3 STEPS TO YOUR ULTIMATE IMPACT AND INFLUENCE: 1. CLEAR CONCISE MESSAGE You stand out to others when you prepare, polish and position yourself. 2. IMPROVE YOUR LISTENING ABILITY “Most people do not listen with the intent to understand; they listen with the intent to reply.” – Stephen Covey 3. UNDERSTAND BODY LANGUAGE AND NONVERBAL CUES Did you know this is 55 per cent of communication? From a leading global company to finding his work-life balance, Ryan Hollis, has bought his wealth of knowledge in assisting businesses become more sustainable, to the Sunshine Coast. And so everfocus was born, offering consulting services to businesses and not-for-profit organisations that aim to be better by being more sustainable. Around 10 per cent of their working time is donated as pro bono services each year. “The work we do spans across many industries, including agricultural, manufacturing, tourism, construction, schools and retail. I often have conversations with people that sustainability can be a lot more broadly focussed than the common environmental aspects of waste, water and climate change, like good health and wellbeing, education, reducing inequality and urban development,” says Ryan. “I am proud that I have that knowledge to give back and share with the community. For businesses who become sustainable, you will often find it can lower costs and make you more profitable, as well as adding value to your local community. Quite often I think there is a misconception that, if you want to be more sustainable, it will cost you more, but it is actually the opposite.” And it’s clear that the aims of everfocus also align with those of wider society. Ryan says that 80 per cent of people prefer to buy a product from a sustainable business as opposed to one that’s not. It’s a way the community can be part of the solution by engaging with business who have like minded goals and value sustainability. As one of the leading schools in Queensland, Flinders is dedicated to educating for excellence in learning and life. We inspire our Prep to Year 12 students to learn, to lead and to serve. CINQ Á SEPT Sass + Bide’s Spring Fall ‘19 collection, Cinq Á Sept, conjures cocktail hour that celebrates summer’s last languid moments. The classic go-anywhere wardrobe offers delicate yet dramatic pant suits and feminine dresses. The collection heroes silk linen and crisp cottons with signature touches of metallic embellishments. have a sustainable business. “The more educated we become on the impact that ‘fast’ fashion is having on our environment, the better. Social media is amazing for educating people on this subject and I think it creates a sense of responsibility to fashion labels to start moving in this direction.” While the ‘slow’ fashion movement is shaping the way brands approach business, for Abby the decision came naturally. She sources all of the materials ethically and sustainably from using recycled lycra for all of the swimwear, right through to using compostable postage packaging. product,” says Abby. “I feel it’s also the consumer’s responsibility to start shopping consciously – not only with labels that are handmade or made from sustainable materials, but to start shopping for fewer pieces. Instead opt for higher quality pieces that will last and not be thrown out after a few wears. I also love reselling or repurposing garments, rather than simply disposing of them.” This month, Abby launches the first drop of her Autumn Winter 2019 collection, with the prints and colour palette inspired by the hues and textures that Abby fell in love with on a journey to Morocco. “We gather inspiration from pretty much anything and everything for our prints. Once we decide on the direction we want a collection to go in, we create an inspiration board on Pinterest. From here we work with our local print designer to create magical prints of our dreams,” explains Abby. “Our print designer will hand draw or paint elements for each print that are then turned into a seamless and always beautiful repeat. Once perfected, this is then digitally printed onto our recycled lycra.” The ever-evolving label continues to create striking, comfortable garments that empower women, while also educating them on the importance of sustainable fashion. OILS Many cultures around the world have used essential oils for centuries, for religious purposes and for healing the sick. Profile enlists aromatherapist of 27 years, Kim Morrison, who shares her knowledge and love on the uses of essential oils. We are a patientcentred practice where the focus is you. Covering your health care needs is our priority. We have onsite pathology, psychology services, a fun and interactive children’s area and a friendly welcoming team. Originating in Spain and widely used throughout southern Europe, rosemary was considered by the Greeks and Romans as a sacred plant. They believed the plant’s oils brought peace and comfort to one’s life. Today, the herb is sacred in the kitchen and is also said to strengthen and stimulate memory. Tea tree is native to the sunshine state and New South Wales. For centuries it has been used as traditional medicine by Aborigines and they would apply the crushed leaves to irritated skin for a cooling effect. It’s also considered the most antibacterial of all the essential oils. A few drops of tea tree in a diffuser helps combat mosquitoes in the late afternoon. ROSA DAMASCENA A romantic Bulgarian aroma boasting beautiful, strong and sweet floral scents. During the middle ages, rose oil was said to bring balance and harmony, and for thousands of years it was used for skin care. Rose oil is known to improve mood and reduce anxiety. A few drops in a diffuser is the perfect remedy after a hard day at work. BOSWELLIA CARTERII An earthy-woody smell is often associated with frankincense; the hardened sap from a tree also known as resin. Egyptians commonly used frankincense oil for perfume, salve to soothe skin and it was also found in Pharaoh Tutankhamun’s tomb! The essential oil has a beautiful spicy aroma, which is thought to promote feelings of peace and relaxation. Note: Oils should always be used with care. Consult a qualified aromatherapist or medical specialist for advice before using oils. Some essential oils cannot be ingested or applied to the skin in certain circumstances. According to Revlon, these are the brunette trends that are burning up in 2019. As the temperatures slowly dip heading into Autumn, trending colours are getting warmer. This season you can expect to see rich honeycomb hues with ribbons of warm chestnut. The secret to nailing this colour is to have various depths to add contrast to your mid-lengths and ends. Ask your hairdresser for some hair painting or balayage highlights with a golden chestnut rinse over the top. The perfect way to maintain this colour between your salon visits is with Revlon Professional Nutri Color Creme to maintain your Autumn hues. Hereâ&#x20AC;&#x2122;s our favourite colours for this season. Nutri Colorâ&#x201E;˘ Creme is a cocktail of colour, providing care and shine for your locks. The creamy blend combines provitamin B5, grapeseed oil, and a selection of ionic pigments keeping your hair healthy all season. LIGHT COPPER For those with rich ginger hair, Nutri Color Creme 740 Light Copper works to enrich faded shades whilst providing a glossy, high shine finish. With active fruit acids combined within the cream formula, the colour delivers a smooth, full finish to keep you looking your best between salon visits. FROSTY BROWN To maintain your classic lustrous brown, 513 Frosty Brown provides instant colour to your hair in a nourishing detangling treatment. Ionic pigments interact with the hair improving gloss, revitalisation and repair. A nourishing treatment to enhance dull, tired hair. DIRECT IONS: 1. Wash and towel dry hair. 2. Wear gloves. 3. Spread the creme with comb or fingers. 4. Comb through and time for 3 minutes then rinse thoroughly. NOTE: Do not apply onto the scalp. If skin is stained, wash at once with cotton soaked in water and shampoo. Queensland has one of the highest rates of skin cancer in the world. Early intervention is the best form of prevention, which is why our doctors at Cotton Tree Medical Centre provide state-of-the-art skin cancer care. In addition, we offer services in all areas of general health and have been committed to providing the very best health care in a family friendly environment. ASH BROWN Frequent shampooing can lead to your colour fading, so to maintain a deeper warm brown look, 411 Ash Brown is intensely pigmented, it’s expected you’ll see the colour working within three minutes. The perfect way to take all the hassle out of keeping your hair looking flawless. LIGH T BEIGE Hydration is key to going lighter and is really important for your hair without it going brittle. Nutri Color Creme 931 Light Beige provides a silky, soft finish whilst maintaining the hue of dark blonde hair. A complex of active fruit acids penetrate the hair to provide much needed nourishment in between professional intervention. middle of the night with a pounding heart, shaking and sweating, which I now know was hypos (low blood sugar). A fasting blood sugar test showed that my blood sugar levels were 38 and a normal level would be four to five,” says Ainslee. determination has made Ainslee the inspiration she is today. Overcoming hardship and using fitness to build her physical and mental strength back up has, consequently, led her to the world stage. It’s a platform where she can inspire others who are also going through personal hardship and health challenges. “I don’t think I’m special or extraordinary – you just do what needs to be done. Some days are easier than others, some days it comes down to prioritising what is really important and what needs to be done and you just do it,” she says. “There’s so many positive benefits to exercising, no matter which form you choose, but one which is really important to me is mental wellness and I’ve recently added outdoor exercise back into the mix with hiking and climbing. “Some days don’t go to plan, but you get up and give it another crack.” They are words we could all use for a little extra motivation. Has your summer holiday caused pain to your heels? As the holiday season comes to an end and we head back to work, many of us have been too busy and have neglected our feet. You may be feeling intense pain in your heels when you take your first step of the morning or after resting. This is most likely because you have plantar fasciitis. Plantar fasciitis is a condition where the plantar fascia (a thick tissue that runs along the sole of your foot) has been overused causing pain almost commonly under your heel. The cause is due to many factors including, flat feet, increase in exercise, poor footwear, occupations that require standing and tight calves. I find many of us try and relieve the pain by adding cushioning under the heel in our shoes, however this is a common mistake that plantar fasciitis patients make. Cushioning the heel does not support the plantar fascia and therefore it’s still being overstretched. Treatment for plantar fasciitis is a case-by-case basis and treatment of the symptoms as well as prevention for recurrence, needs to be addressed. Alignment of your skeletal structure to create better function when walking and standing with Kinetic orthotics will alleviate the pain of plantar fasciitis in the long term. In conjunction with this; shockwave therapy, strapping and a stretching and strengthening plan can be made to aid recovery as quickly as possible. If you knew that a simple 10 minute meditation practice each day would improve your self-confidence, clarity and decision-making abilities you’d likely be onboard, right? So, what prevents most of us from setting an alarm clock a few minutes earlier each day to make time for this beneficial practice? The biggest misconception around meditation is that to be successful at it, you have to sit still in one spot and for a long period of time. And it’s myths like this, that make us want to hit the snooze button. It takes as little as 3-minutes: A great way to ignite a daily meditation practice is to start with a simple three minute meditation. You can use a guided meditation from apps like Insight Timer to start with and then try without guidance after a week or so. This will allow you to build up to a 10 minute practice over time. Meditation allows us to focus on one thing at a time and the attention is placed kindly, and curiously on whatever is unfolding, moment by moment. This creates space in the mind for you to begin to choose what you are responding to. Without attention training, it’s easy to get caught up in reacting quickly and habitually to events as they arise, within and outside of you, which often leads to regrettable emotional episodes and the creation of disease like stress, anxiety, and overwhelm, that can manifest physically into cardiovascular and other health issues. So, set that alarm clock and make time for this super-beneficial practice. Book in and make an appointment today! With so many diets and health trends circulating on social media, it’s hard to work out what’s good for you and what’s bad. Profile enlists expert nutritionist and dietician Tess Keightley who identifies the health fads and diet myths of 2019. Speaking with Tess Keightley, it’s evident she leads a healthy and happy life. Growing up on the Sunshine Coast she says she was constantly in and out of the water, surfing or participating in Surf Life Saving. “I grew up as a fairly active kid. My lifestyle now has a very balanced approach when it comes to nutrition. I like running along the beach and I enjoy pilates. I guess I practice what I preach,” laughs Tess. After becoming a qualified dietician and nutritionist, Tess started up her own business, Authentic Spoon. It first began online, busting diet myths and teaching people about food fads, before developing into consulting. “I want to be able to give the general public evidence-based nutritional information because I feel like there is an oversaturation by online, social media and ‘Dr Google’, with a lot of people promoting healthy eating and diets which aren’t necessarily backed by science,” says Tess. Nutrition is a difficult subject to cover and is approached differently by all of us. So what we are aiming to do is divulge the food trends and the dos and don’ts when it comes to nutrition. “I am very mindful of how I do it. People have different views and opinions, so I look at the pros and cons of the situation and use my nutrition science to see how it will benefit your body or have a negative impact.” Before we get to the fads, let’s look at the diets and how social media influences what we eat. “There is a lot of pressure online – and we call it ‘diet culture’ – for females to maintain a certain body shape and size,” says Tess. It’s important to remember, before criticising what you see in the mirror on the outside, isn’t always a true reflection of inner health. “People think they need to be a certain size to be healthy, when there is a huge push in the dietetic community to say it’s what you are on the inside, not what you look like on the outside,” says Tess. Flipping through countless magazines and scrolling Instagram feeds, there’s no denying we can’t escape the media models. “A lot of young girls look at this and think, ‘that’s what I need to look like’ and that has been happening for years in beauty magazines. Now it’s become an issue with social media influencers doing products and promos with weight loss products.” Tess stands by her motto that health should come from food first, before people take on diet shakes. Magazines have been promoting body image for years, before hitting social media. It’s the same with food, the latest crazes come and go. In 2017, it was the year of the paleo, last year we saw the Ketosis movement and this year it’s ‘fasting’. So are these fads any good for us? And are there any benefits? We offer on-site and in clinic drug and alcohol, scheduled and incident testing. All of our testing is compliant with the Australian standards. We often move self-love to the back of our mind, but there’s no better time to find your body bath ritual than right now – the health benefits are worth it! So grab your Profile mag, pour a glass of Rosé and enjoy a luxe bubble bath, because it’s time to get soaking. Tracey G Prosthetics is a one stop shop having the largest range of prosthesis, lingerie and mastectomy apparel available. We have trained fitters who ensure your comfort is achieved first time. Call or pop in, we’d love to see you Now at the WESLEY HOSPITAL! BUBBLE BATH What better way to relax after a long day than in a soothing bubble bath? One of our favourites is Soak Society’s Bath Dew Flower Power, which combines the delicate extracts of magnolia, rose and orange, along with magnesium and larch tree extract, to soothe and hydrate your body. The warm bath will help alleviate muscle pain and relax your mind and mood. You could also enjoy your ‘me-time’ with a glass of wine. they do vary slightly; traditional Finnish saunas use dry heat with relative humidity, while Turkish-style baths involve greater levels of humidity. Either way, sweating it out is known to increase circulation, reduce muscle soreness and promote relaxation. INNER GLOW Needing a little facelift? A steam facial might just do the trick, helping you achieve fresh dewy skin. A facial steamer is an easy two-step process: the warm vapour helps loosen and flush out dirt and impurities that are clogging pores, while giving you a warm and fuzzy feeling. The cool mist then closes pores, enhancing skin tone and elasticity, leaving you with a glowing complexion. SALT SOAK If bubbles aren’t your style, why not try a luxe-wellness soak from your own home? Take some time and indulge using active Pink Kaolin clay, rose oil and Himalayan pink salts that help promote detoxification. Float like a queen in your own pink bath for about 20 minutes (uninterrupted) for maximum benefit. FLOAT SPACE It’s said that floating inside a float pod for an hour is equivalent to eight hours sleep... need I say more? Float therapy is a small pod containing a shallow Epsom-salt water solution, which is recommended to ease pain and stress while reviving your mind and body. It’s an hour of power that’s assured to leave you feeling refreshed. Sunshine Coast Obstetrician / Gynaecologist providing birthing and surgical services at Buderim Private Hospital. Providing a caring and respectful environment to discuss your concerns. Caring for Women through all stages of their life. Sprawling homes are part of the Australian dream, but what if I told you the way of the future is taking our upsized lifestyles and downsizing it? Jimmy Hirst and Kimberley Palmer, show us the ins and outs of low impact living. Jimmy Hirst and Kimberley Palmer are partners in life and in business; they lead a simple and modest lifestyle. For seven years Jimmy has poured his time, energy and passion into developing Polkadot Tiny Houses, a social movement encouraging communities to live in sustainable houses no bigger than your average living room. “About a third of the people who live in a tiny house feel it’s not just a house but it’s a piece of lego that will help us downsize and reduce our impacts on the planet,” says Jimmy. For years Jimmy worked in mass media as a ‘social engineer’ introducing electronic dance music from Europe to mainstream radio in Australia. the state and local governments categorise tiny houses. The problem they have is a tiny house can be fixed on land or have wheels to be towed. “The hard and fast rule at the moment is a tiny house is a caravan and a caravan is allowed to stay on a property on the Sunshine Coast for up to six weeks without needing an approval,” says Jimmy. “If the house is fixed, you need to own your property and it must comply with current building regulations. “The thing is, it’s an attitudinal change which a lot of younger people and middle aged people are being forced to confront due to the economy.” In the meantime, Jimmy and Kimberley are working to educate communities, councils and the State Government around what flexible, sustainable and smart living looks like and how it can be used for the benefit of our environment moving forward into the future. Nestled amongst bushland, pulsing with natural watercourses, itâ&#x20AC;&#x2122;s evident from the first look that this Lake Macdonald property was made to blend comfortably in its natural environment. Built and designed by Josh Martin, we unearth what makes this home so special and sustainable. Day in day out, Josh Martin is a man who works hard. He admits he needs to be kept busy, using his skills and trade to build not just homes but his business, Josh Martin Design and Constructions. “By the age of 18, I was a fully qualified carpenter. My job was my passion,” says Josh. That passion continued over the next 26 years, designing many unique homes that capture the region’s coastal sea breezes and natural environments. “I wake up pumped for the day and get a real buzz out of seeing my client’s dream homes become a reality,” he says. He isn’t shy to say he is a perfectionist with his buildings reflecting confidence, experience and professionalism qualities that are also mirrored in the dedicated builder. “In my experience, I have seen both successful and unsuccessful builders, and the most important rule I learned was to keep quality in all you do,” he explains. “This has always been my mantra and, so far, it has treated me and my clients well.” What’s important to Josh is making sure his designs reflect their surroundings, taking into consideration the dwelling and the land. Many of his projects are on sloping blocks, residential areas and in the hinterland. “All of these environments have special consideration during the design process. It’s great working with a range of different sites, each one having their own unique challenges,” says Josh. There’s no doubt building is difficult and has its challenges, but for Josh the hard work has paid off. Last year, he was honoured and proud to receive the Queensland Master Builders Excellence in Sustainability award for the stunning Lake Macdonald residence. and, essentially, make the house low maintenance. The house also runs off 12kw solar units and has two 25,000-litre rainwater tanks. “The home has a Blackbutt timber floor in the living, dining, kitchen area, which is milled from a sustainable plantation along with the hand-crafted timber trusses.” LED lights are also used throughout the home, with an energy efficiency rating between 80 to 90 per cent, providing longevity. “I think, as a society, we are all more aware of the impacts we are making daily. Even the smallest of considerations when it comes to building or renovating a home, such as lighting choices, can help improve a person’s ecological footprint,” says Josh. Building with comfort and the future in mind, our homes play a vital role in reducing our carbon footprint. There are things we can all do around our own homes to make them more sustainable and cost efficient. “Depending on cost, you can make small and large changes to your home to create a more sustainable dwelling - change to energy saving bulbs, install solar panels, use local materials, use thermal blackout curtains, the list goes on. “Any form of change can help make a difference.” They’re all smart ideas to consider when we purchase or build our next home. cha ra cter development, schola rship & commu nity With impressive facilities across Junior, Middle and Senior Schools, students grow through a diverse learning program and caring environment. We invite you for a tour where we will show you how we provide our students with SECURITY, SUPPORT and SUCCESS. Forget ‘cookiecutter’ styles this season. Sunshine Coast interior designer Kate Gillard reveals her top five trends to transform your home. From earthy tones to reviving Art Deco, this style edit has something for every home. As a new season brings about change, it might be the perfect time to look beyond just your usual clean and focus on giving your home a new look. Profile enlists the help of Sunshine Coast and Brisbane-based Studio Collective interior designer, Kate Gillard, who shares her industry experience spanning six years. After extensively studying Interior Architecture and Interior Design and Fine Art, her eye for detail has led her to work across a variety of different fields, including visual merchandising, residential and commercial design, along with revamping hotels. Delivering projects from concept to the final stages of styling is a major part of Kate’s role, along with knowing what works and what doesn’t. Things like understanding where to place furniture and art, and what colours and textiles, shapes and surfaces respond well with each other and the homeowner. On that note, Kate shares with Profile her top five interior trends for this season. SUITABLY SUSTAINABLE Using furniture and items that can be recycled, or made with repurposed materials, gives a home an authentic look. Don’t be afraid to use timber that has imperfections, it offers an earthy feel throughout the home while vintage or second hand one-off pieces can bring character. Sourcing sustainable items might take a little longer, but it’s a small price to pay for a healthier planet. CORAL COLOURS The global leader in colour forecasting, Pantone, has revealed the colour of the year is ‘Living Coral’. The vibrant colour symbolises our innate need for optimism and happy pursuits. The deep pinky peach colour certainly brightens a living room space.You could add a pillow and linen throw over the lounge, or even a boutique coral lamp in the reading corner. It’s also a lively and spirited colour useful for revamping the guest bedroom. This year, we will see this colour populate everything from our instagram feeds, the runway and our interiors - it’s definitely a colour with which to get on board. ART DECO It’s the European movement, which first appeared in France before the First World War, an era that influenced decades of architecture, furniture, jewellery and fashion. The movement revolves around strong geometric shapes and patterns offering opulence and glamour while setting the theme for the room. Kate says Art Deco will give your home an influential comeback with items including bar carts, metal furniture and tasteful feature walls. Remember it’s all in the detail! and save your bank account. Instead it will force you to question what you need and don’t. By ruthlessly Spring cleaning, you will find your home looks and feels fresher and also highlights hero pieces that need showing off. GREEN WITH ENVY Greenery in a house not only purifies the air, but it’s a wonderful way of brightening a home. Adding a fiddleleaf fig in the corner, or maidenhair fern on your bookshelf, for instance, is aesthetically pleasing and boosts moods, while a succulent will thrive just about anywhere. Hanging ferns or potted vines are also growing in popularity, perfect if you have limited space and want to add a certain something to your outdoor courtyard or balcony. Quality, industry-standard training has the power to boost productivity and skills – which in turn can save a business plenty of time, effort and money in the long run. future and current employees, but are ensuring that we are across new developments so we can address the region’s training needs as they arise.” Dean has lived on the Sunshine Coast since 2011 and says although the region has grown and changed over the years, one thing he believes has remained consistent is the collaborative nature of local businesses, and how supportive the community are of local enterprises. “I don’t think the Sunshine Coast will ever lose that quality; it may be growing, but we are still very much a tight-knit community that care more about supporting people they like and believe in,” he said. “TAFE Queensland has been around for over 135 years and is the largest training organisation in Queensland, so we clearly know what we’re doing. But it’s our authenticity, and our genuine desire to help local businesses be the best they can be, that draws industry to partner with us.” Discover study options at TAFE Queensland by visiting tafeqld.edu.au or calling 1300 308 233 to learn more. There’s no denying it, dessert is my favourite. It’s what you’re left thinking about at the end of a meal, as the final flavours linger at the end of your palate and you’re left looking down at your empty plate wishing it had the magic of a never-ending packet of Tim Tams. When it comes to birthdays and other celebrations, my mind always swirls with inspiration and flavour combinations, but sometimes I find it even more fun to whip up a delicious dessert instead of a traditional cake. For my husband’s birthday, I made two cakes (for two celebrations) and they were slight adaptations on each other. I had two white chocolate mud cakes in the freezer (thanks for the tip, Katherine Sabbath), and these formed the canvas upon which I built my flavours. The first was based on lemon meringue pie; iced with lashings of chantilly cream, a lemon curd drip, meringue disc on top and sprinkled with lemon zest. The second was even more decadent (and I’ve included the recipe below for you); white chocolate mud cake glazed in caramel, topped with macadamia nut meringue and sprinkled with white chocolate curls. two or three months before it gets freezer burn. If you’ll be decorating the cake in the morning, remove the cake to thaw the night before. MACADAMIA NUT MERINGUE 2 eggs 110g caster sugar Handful of chopped macadamia nuts Preheat the oven to 150ºC and line a tray with baking paper (because I planned to sit the meringue on top of the cake, I marked out the shape and size I needed on the underside of the sheet). Separate the eggs, so you only have the whites in the bowl (you can store the yolks in the fridge for up to 24 hours, they are very handy for making lemon curd or carbonara sauce). Whisk the egg whites on a low speed until they become foamy and then increase speed to high for about three minutes, until soft peaks form (don’t over whip, otherwise the eggs split and become watery). Add the sugar, one tablespoon at a time, and the mixture will become glossy and form stiff peaks. Gently stir in the macadamia nuts, being careful not to knock the air out of the meringue. Spoon the mixture onto the prepared tray and create dramatic peaks using the back of a spoon. Reduce the oven temperature to 140ºC and bake for 35-40 minutes and then turn the oven off, leaving the meringue to cool and dry out for three hours. Note: You can double the recipe and make two meringues, in case one doesn’t work out. Once you’ve made the mud cake and macadamia nut meringue and both have cooled completely, lather the cake with caramel (I use Top n Fill because it’s easier and has a thicker consistency to ice a cake, but you could always make your own), then carefully place the meringue on top and dress the cake with white chocolate curls (I use a vegetable peeler to achieve long curls, but you can always grate chocolate for a different visual appearance). Serve with your favourite vanilla ice cream. FEEL WELL The Sunshine Coast is home to a plethora of eateries proudly serving delicious dishes that are low on food miles and high on taste – you’ll also find they’re good for you too. Win, win! JUNGLE JUICE Acai berries, pineapple, passionfruit, strawberries, banana, apple juice and honey Twenty years ago, Raw Energy launched as a healthy food and lifestyle alternative, born out of the daily life of the Sunshine Coast. With a focus on fresh food made from real ingredients, they offer healthy and hearty all day breakfast and lunch menu, energy bowls, burgers, wraps and sandwiches, and of course their delectable choice of smoothies and juices. Slow roasted victorian pulled lamb shoulder, Greek feta, oven roasted capsicum, Spanish onion and finished with fresh rocquette and house-made tzatziki Can’t decide what to order? Why not bring your family and friends together and indulge in a share-style spread. With over 25 years at the forefront of the hospitality industry, All’ Antica offers some of the best Italian cuisine on the Sunshine Coast. The fully licensed restaurant boasts traditional dishes, all created from the best produce sourced locally, as well as imported ingredients from Italy. MISO R AMEN Miso broth, pak choy, roast baby carrot, spring onion, chilli oil and wood ear mushroom Following a plant-based diet no longer means you need to deprive yourself, thanks to revolutionary eateries like Cafe Vie. Whether youâ&#x20AC;&#x2122;re a devout vegan or not, Cafe Vieâ&#x20AC;&#x2122;s menu offering is guaranteed to please, with breakfast burritos, waffles, burgers and baos. On the corner of Gloucester Road and Main Street in Buderim, make sure you pop in for breakfast or lunch soon. HEALTH LAT TES Charcoal, matcha, turmeric, beetroot and blueberry health lattes made on 100 per cent powder extract and steamed with almond milk; and matching health balls. All vegan, dairy free, gluten free and refined sugar free While Mint Buderim (and now their newlyopened espresso bar in Birtinya) is known for serving delicious speciality coffee, did you know they also offer a wide range of health lattes to nourish your soul? Mint also has a scrumptious selection of bites too, including protein balls and bowls. TACO Free range Rhodavale pork shoulder, house pickles, guacamole, chipotle mayo Hungry Feel Eating House is a place for you to eat well, drink well and enjoy the company you share. Hungry Feel believes in good food, served well. They use fresh local and seasonal produce with respect and their chefs source quality ingredients from local businesses and producers to keep their food miles minimal. Eating food has become such an automatic response that we’ve forgotten why it’s there in the first place – to nourish us, to give us energy, to keep us healthy. But with chemical-coated ‘food’ continuing to dominate fridges and pantries, Cyndi O’Meara has ramped up her quest to educate the masses. Cyndi O’Meara snacks on nasturtium flowers plucked straight from the vine, as she shows me around her happy place in the Hinterland. The self-seeding garden is abundant with beautiful herbs and vegetables, complementing the fruit trees planted across the undulating 60-acre property and a larger garden boasting heartier vegetable varieties, all of which feed Cyndi and her family. Cyndi’s eldest son, Brogan, also works on the farm and shares her ethos for fresh, organic produce, a serendipitous full circle movement, given Cyndi’s thirst for knowledge began when she was pregnant with Brogan 30 years ago. “This all started because I had babies and I wanted to do the best for my babies,” she says. “When I look back on what I knew 30 years ago and what I know now; and I was pretty ferocious 30 years ago; I think of the mistakes I made, but it’s because I didn’t have the knowledge, nobody had the knowledge and what I know now, it’s for my grandchildren.” Cyndi’s home is humble, an old dairy with polished concrete floors, clay coated walls and second hand furniture. It’s real, it’s organic, and it couldn’t be more home for Cyndi, who dreamed of owning acreage since she was 19. “It’s food security for my family, that’s why I planted the trees immediately, there will be enough food here for my whole family and future generations to live on and some left over for the local community, that was my aim; it’s for my family,” she says. Originally from Bendigo in Victoria, Cyndi, who was also a fanatical skier, attended the University of Colorado in Boulder. Knowing she wanted to work in the field of health, Cyndi studied pre-med to tick off her science subjects. We spend so much time focused on what’s going on around us that we forget to take a closer look within. Nutritionist Cyndi O’Meara shows us a few simple ways to incorporate real foods back into our diet. PECAN CINNAMON SPICED FRUIT CAKE 3 1/2 cups mixed dried fruit (I used oil and preservative free cherries, raisins, dates, figs, apricots, currants, goji berries and cranberries). 3 tsp cinnamon 1/2 tsp nutmeg 2 tbsp vanilla essence Zest and juice of 1 orange 1/3 cup coconut oil 1/2 tsp seaweed salt 5 eggs 1 cup almond meal 1/4 cup rapadura sugar 3/4 cup emmer wheat flour, sifted 1 cup mixed nuts (I used almonds, brazil and pecans + extra pecans for garnishing) Optional: Add in ginger, turmeric, all spice, cacao melts, espresso shots to taste etc. Preheat the oven to 170ºC. Grease and line a spring form cake tin. Mix all ingredients together in a bowl until combined. Pour into the cake tin and top with the pecans decoratively. Cover the top with alfoil and bake for 40 minutes. Remove the alfoil from the top of the cake and bake for a further 15-20 minutes or until cooked through yet still moist. Remove from the oven and allow to cool. haven with a detox box, lavender saunas and outdoor mineral spa pools. After a day at the spa, make sure you book into The Lake House, for cutting edge seasonal food overlooking magnificent views of Lake Daylesford. ADVENTURE SEEKERS Lord Howe Island, NSW If you are craving a luxury Island escape but don’t want to make a long haul flight to get there, then why not consider Lord Howe Island for your next ladies weekend? This is definitely an island that offers both luxury relaxation and adventure. From lying on the sand to stand up paddle boarding, kayaking or diving a little deeper to snorkel, the water babies are covered. On the land, enjoy a spot of golf with incredible island views, or you can stretch the legs – Lord Howe Island is home to some amazing hiking trails. Enjoy a scenic hike up Mt Gower or capture the panoramic views from North Bay, or head up Malabar Hill overlooking Mt Gower and Lidgbird. After all those activities, rest the legs at Capella Lodge, the island’s premium boutique accommodation, commanding ocean views. DESTINATION DESIGNER THREADS Sydney, NSW If your tribe is in need of a weekend of serious retail therapy and your kind of relaxation includes happy hour at a rooftop pool, then this might be just for you. This destination is sitting pretty on the corner of Glenmore Road and Oxford Street in Paddington, home to high-end fashion and the occasional celebs. Brimming with home grown designers – the likes of Zimmerman, Manning Cartell, Alice McCall, and Scanlan and Theodore – this intersection is one of the most fashionable shopping districts, offering the country’s most polished threads. Sydney is spoilt for chic shops, but for a good dose of retail therapy, clustered along Pitt Street, there is an abundance of stores. If you can manage, carry your bags back to one of our favourite places, Le Rivage in Sydney’s Darling Harbour – accommodation that offers a ravishing rooftop pool bar that overlooks the city. Relax and catch up on that muchneeded girl time. You might even catch the weekend fireworks igniting the sky. THE BIG CHILL Hobart, TAS A short flight away and you feel like you are in a different part of the world; instead you’ve flown just over four hours and landed in Hobart, home to rugged beaches and green rolling fields. If renting a home is more your style, there are plenty on offer. Cosy up by the fireplace when the temperatures drop and enjoy a homemade meal, cooking together over a few bottles of wine, dance away to your favourite songs and end the night with a good chick-flick. If you need a little more charm, book into a bed and breakfast or quaint Fitzpatrick Inn. There’s plenty to see and do in Tasmania, like roaming around Launceston seaport boardwalk, drive around some of Tasmania’s heritage architecture including Government house before venturing to Home Hill Winery where you can enjoy the stunning views over a tasty drop and cheese board. BEACH BLISS Byron Bay, NSW Just a three hour drive south, you’ll cross over the border and into beautiful, and commonly known, ‘hippy’ Byron Bay. It’s a place that is calm, casual and cool – a place that offers endless beaches, organic places to eat and farmers markets on alternate weekends, making you feel like one of the locals. Rent a house or beachside camp. There’s plenty to do if you are looking for a casual and relaxed beachside escape. Some of our favourite picks for coffee and eating include Harvest Cafe, Three Blue Ducks and roaming The Farm. The fresh air and footpath wandering is likely to end you up at Spell – a high-end bohemian fashion house boasting stunning colours and patterns. End your evening by stepping into the Mediterranean-styled Mez Club for a cocktail specialty. If you are looking for a place to explore, indulge and invigorate your senses, then Australiaâ&#x20AC;&#x2122;s oldest wine region might be the perfect place for your next weekend escape. Profile shares our insights on the premium wines, delightful degustations and will take you up, up and away over the many vineyards of the Hunter Valley. A short flight from the easy-going Sunshine Coast Airport will have you landing in Port Macquarie for a short drive to the Hunter Valley. We do recommend you fly out Friday night to wake up fresh and maximise every moment you have around the untouched natural landscape that is home to the Hunter Valley. One of the best ways to get around is by hiring a car and heading winery hopping, but if you are planning a boozy day out then opt for a taxi. Start at Keith Tulloch Winery, where the family-owned vineyard grows Semillon, Marsanne, Chardonnay and Shiraz, all planted in 1968 on the ancient floodplains of Rothbury Creek. Enjoy a wine tasting and sit out on the balcony overlooking the abundance of grape vines. We recommend your next stop be Tyrrell’s Wines, which has been Australian family owned since 1858, for a cellar door tasting at the country homestead – well known for Australia’s awarded wine, Vat 1 Semillon. The Hunter Valley has all the ingredients for a gourmet getaway, with four SMH Good Food Guide hatted restaurants. We recommend an al fresco lunch in one of the nearby vineyards, or Two Fat Blokes gourmet kitchen for a casual bite. For your next stop, drive down the road to Matilda Bay Brewery. What better way to finish a hard day of wine tasting than with a cleansing beer? Instead of watching the sun rise over your balcony overlooking vineyards and bushland, you will be watching it from a hot air balloon. This is a must-do activity when in the Hunter Valley for the weekend. Fly high over the vineyards and countryside to see the region through the eyes of a bird; it’s an experience you will be recommending and, I promise you, it’s unforgettable! Once you have your feet firmly back on the ground, enjoy a champagne breakfast before using the day to explore this gem of a place. There’s a plethora of wineries you can venture to, or go horseback riding around the beautiful Molly Morgan Range, experiencing the Lower Hunter and as far North as Barrington Tops. Visit the famous Hunter Valley Gardens that span 14 hectares with 10 different themed gardens, all meticulously designed and manicured. All this can be done while indulging in cheese, chocolate and artisan products at the markets. When you board the plane back to the Sunshine State, you’ll be planning your next trip. With the Hunter Valley boasting 150 wineries to choose from, it will keep you busy for weeks! GRACE QPAC’S STAGE Standing among some of the world’s greatest ensembles, The Sixteen delivers a sound-bite of heaven at Queensland Performing Arts Centre. While Silkroad Ensemble connects cultures in a roving musical performance. Two shows you won’t want to miss! the passion of Founder and Conductor Harry Christophers CBE. The Sixteen’s more than 100 recordings reflect the choir’s quality in a range of work spanning the music of 500 years. The choir has won many awards, including the coveted Gramophone Award for Early Music and the Ensemble category at the prestigious 2018 Royal Philharmonic Society Music Awards. An Immortal Legacy is one of The Sixteen’s most popular programs and spans more than 500 years of British choral music. Composers from the 16th century, Thomas Tallis and William Byrd wrote at times of religious turmoil and national upheaval, producing magnificent works of beauty and musical mastery. Their legacy can be traced to some of Britain’s most celebrated 20th and 21st century composers, including Benjamin Britten, Sir Michael Tippett and James MacMillan, whose works complete this enlightening program. The incredible clarity of The Sixteen’s voices is a majestic match for QPAC’s Concert Hall. WHEN: 14 MARCH 2019 WHERE: QPAC CONCERT HALL BOOKINGS: QPAC.COM.AU OR 136 246 cultures forge on the stage, guests will enjoy a night of Chinese and Kazakh music, Finnish folk songs, Indian classical, popular jazz, traditional Vietnamese music and much more. Performing their genre-defying music for the first time in Queensland at QPAC’s Concert Hall, it’s certainly a night to remember. Large-scale windswept landscapes intricately created by the brush strokes of international artist Katherine Wood. For more than a decade, Katherine has expanded her work from South Africa to the Sunshine Coast, opening up her first fine art gallery in Montville. open her first Australian gallery in Montville. “We love the once-off uniqueness of Montville, the other existing art galleries and just the special atmosphere it offers. Montville has always been a wonderful creative hub for tourists, but, with a number of new galleries opening in the last year and the expansion of the Sunshine Coast Art Gallery Trail, I am attracted to the collaborative and supportive creative community that the Sunshine Coast offers,” says Katherine. then we are capable of doing this with our emotions, so our feelings don’t need to control us,” she explains. “Through my paintings, I attempt to draw the viewer deep into its (the painting’s) space and encourage us not to turn away from problems, but to stand in the eye of the storm with a calm and collected response.” Katherine says she has always lived and breathed paint. It was a passion from even when she was in primary school, which led her to the University of Stellenbosch, in west South Africa, where she spent five years studying fine art. “Most of my paintings are spontaneous and they simply evolve from the process of painting,” she says. Katherine’s gallery also features work from local artists Rayma Eveson and Tara Spicer, along with well-known South African artist Carrol Boyes – all of them commanding an art enthusiast’s eye. “There is a definite trend worldwide to seek out more bespoke cultural offerings when travelling, and Montville provides a complete cultural experience for people – strolling through galleries that offer sculptural works, photographs, prints and paintings, eating at beautiful restaurants and then shopping at boutique fashion retailers – all with a spectacular view,” says Katherine. It’s a flourishing art scene that’s worth the drive. Costa GEORGIADIS For seven years, green thumb and gardening expert Costa Georgiadis has been entering our living rooms, sharing his charm, charisma and passion on ABC’s Gardening Australia television show. The much-loved host is an eco-visionary, focusing on the sustainability and availability of soil and water. Costa shares his tips for a luscious green garden and his views on sustainability. I GREW UP… in Sydney in North Bondi. I also spent a lot of time on my godfather’s farm in the Bylong Valley, New South Wales. THE FIRST THING I DO IN THE MORNING IS… open the blinds and look outside to enjoy what day has been delivered. I’m immediately conscious of the sounds of the birds when I wake up. Then I make my bed; it’s something I was taught by my mum to always do. I BECAME A GARDENER BECAUSE… gardening was just part of growing up. My grandparents were always in the garden and growing something to eat and equally loving the flowers to bring into their home – the colours and the scents. They were so sustainable about their lives, without the term or the trend or the movement. They lived frugally because they understood the value of saving… saving what they had to make it stretch for the future. MY FONDEST CHILDHOOD MEMORY IS… being on the back of the ute on my godfather’s farm on a cold morning or night, and being allowed to jump off the ute and open and close the gate to allow the car to go through. I LOOK UP TO… Sir David Attenborough, I admire the vision and capacity to connect the innermost workings of our planet and deliver the information in such accessible and engaging storytelling. I VALUE OUR ENVIRONMENT BECAUSE… it’s what we have when it’s all boiled down. It’s who we are, where we come from, how it has shaped us. It supports and supplies us with food and fibre and shelter and, at the end of the day, our cities and suburbs are our campsites. MY GARDENING TIP IS… never underestimate the importance of soil preparation. Spending time to check and test your soils pH, to add some organic matter in the form of compost and worm casting, to ensure your soil has a skin in the form of mulch… all of these preparatory activities build a soil bank account that you and your plants will be able to draw upon. MY HIDDEN TALENT IS… being able to sing and dance and play music with our band The More Please Orchestra. It’s a part of my world that I treasure. IF I COULD BE ANYONE FOR A DAY… I would love to immerse myself in the world of iconic oceanographer and lifelong oceans and environment campaigner Sylvia Earle. 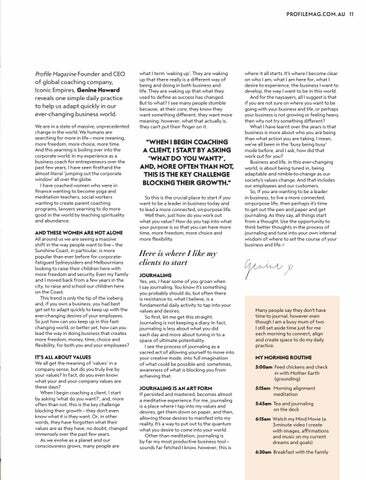 Profile Magazine Founder and CEO of global coaching company, Iconic Empires, Genine Howard reveals one simple daily practice to help us adapt quickly in our ever-changing business world.